Reading Street™ Common Core, Global Edition ©2016 inspires you, guides you, and prepares you to teach. Every lesson is finely tuned to teach the Common Core State Standards (CSSS). It will validate your current practices, spark new insights, and nurture your love of teaching. Take a look at our 10 reasons to love Reading Street flyer. Reading Street Common Core, Global Edition ©2016 helps you teach with confidence and assurance. Aligned to the Common Core State Standards,it helps prioritize instruction to support higher levels of reading and writing and makes the increased expectations of the Common Core attainable. Increase text complexity in reading. Balance fiction and informational texts. Focus on informative/explanatory, argumentative/opinion, and narrative. Build content-area knowledge. Balance fiction and informational texts. Introducing the Realize platform. An amazing way to learn, and an incredible way to teach. Realize engages students like nothing else. Reading Street Common Core, Global Edition ©2016 can be accessed anywhere, any time, and on any device – plus it can be personalized! eTexts - Read, take notes, listen to narration. Videos, Games, and Animations - Practice, watch, sing, play! Leveled Text Search - Search by Lexile, Guided Reading, and DRA levels. Online Assessment - Assess online, access instant reports, inform instruction. Digital Workspace - Interact directly through typing, writing, or drawing. Build a digital portfolio. The digital components of Reading Street Common Core Global Edition on Pearson Realize will be available in July 2016. Introducing Reading Street Sleuth. Good readers search for clues when they read. They ask questions. They examine the evidence, draw conclusions, and make their case. 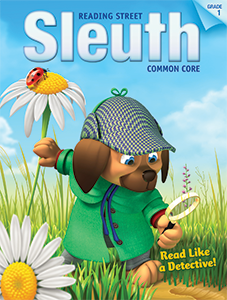 Written specifically for the Common Core edition, Sleuth asks students to unlock the mysteries of complex text and become thoughtful and curious readers. Short selections with higher, grade-level readability. Increasingly challenging literary and informational content. All students have access through scaffolded instruction. Weekly opportunities for close reading and performance tasks.